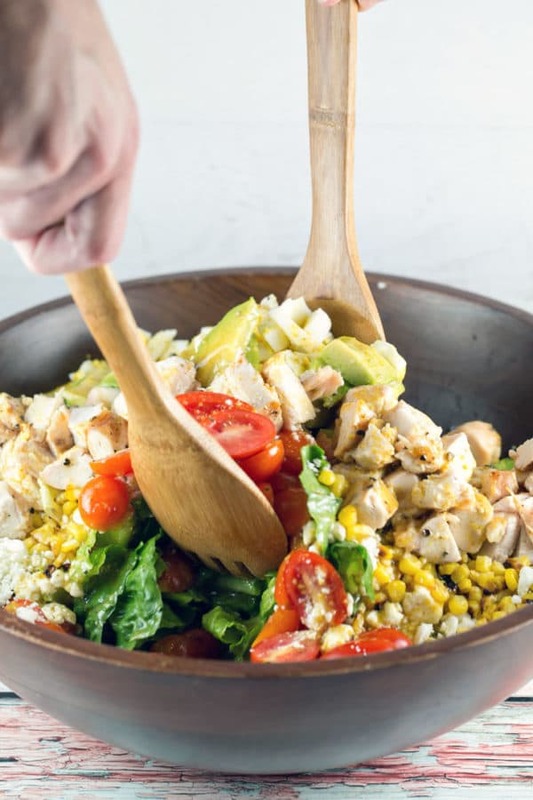 An easy grilled chicken cobb salad is the perfect 20 minute meal to please the whole family! Easy, quick, and made from scratch, it should be a regular staple in your dinner rotation. I can’t get enough grilled protein salads in the summer. Steak salad? Yes, please. Salmon salad? 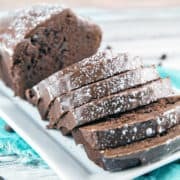 Absolutely (recipe coming your way soon!). 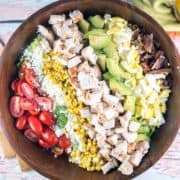 This grilled chicken cobb salad? 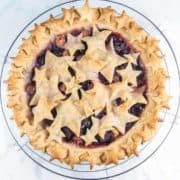 We probably ate it at least twice a month from May onward, and I have no intention of slowing down as we roll into fall. It’s just so dang easy. Weeknight dinners are always a struggle. By the time I get home from work, it’s often 7pm or later, which means we have two hours to cook, eat, play, and get our 2 year old to bed. 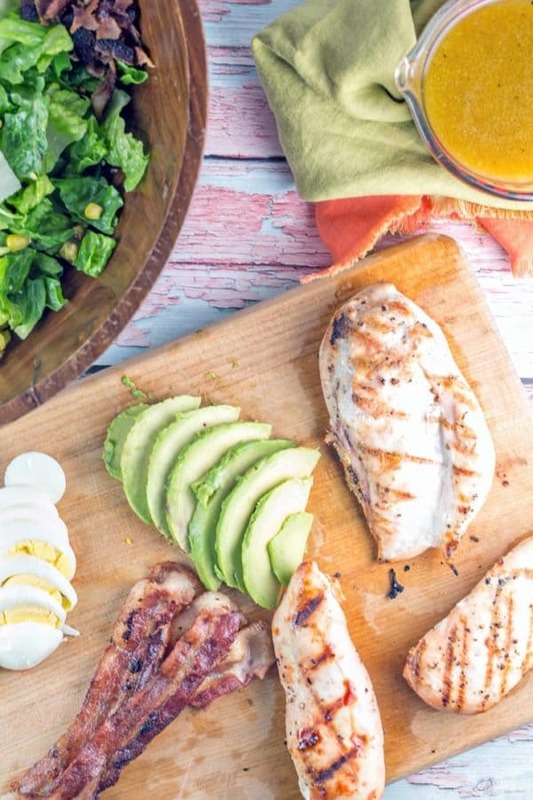 With this grilled chicken cobb salad, I can get dinner on the table in 20 minutes, start to finish. Yes, please. Come home, preheat your grill. While the grill is heating, cook the bacon and start water for the eggs. Chop your veggies. Add the chicken to the grill, and cook the chicken while you make the homemade dressing. Flip the chicken, move the eggs into an ice bath, assemble the vegetable components. Take the chicken off the grill and let it rest while you peel and slice the eggs. Done. Want to make this even easier? Make the salad “meal prep” style, making and assembling things ahead of time. Over the weekend, boil your eggs. 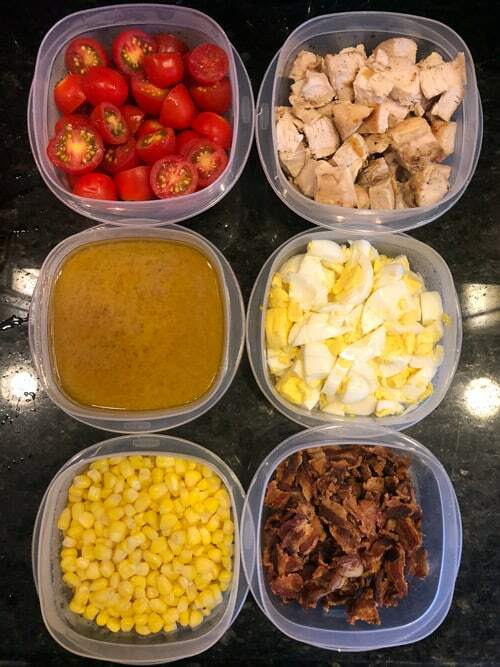 Fry the bacon, grill the chicken, thaw the corn, slice the tomatoes, make the dressing. When the time comes, literally all you need to do is cut the avocado, add some lettuce, and sprinkle with cheese. Assembly time: 5 minutes. Boom. An easy, veggie-packed dinner made in under 20 minutes that the whole family enjoys? You can see why I make this so frequently. 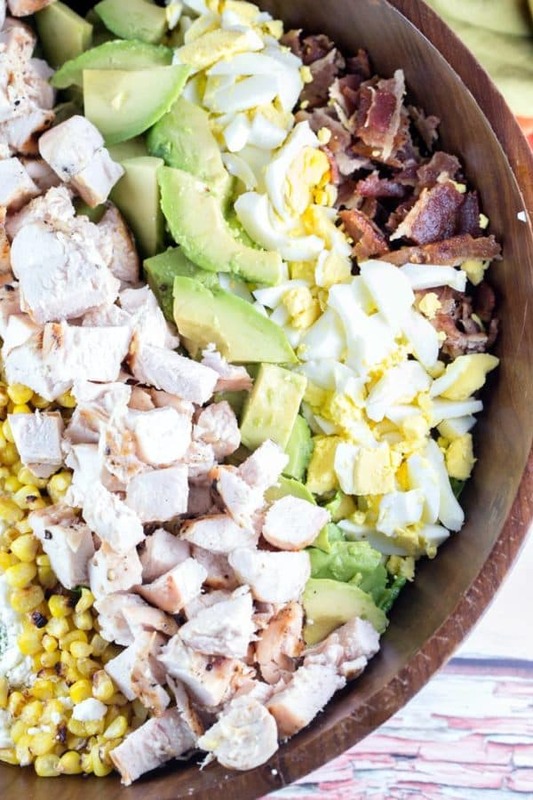 What Is In Cobb Salad? 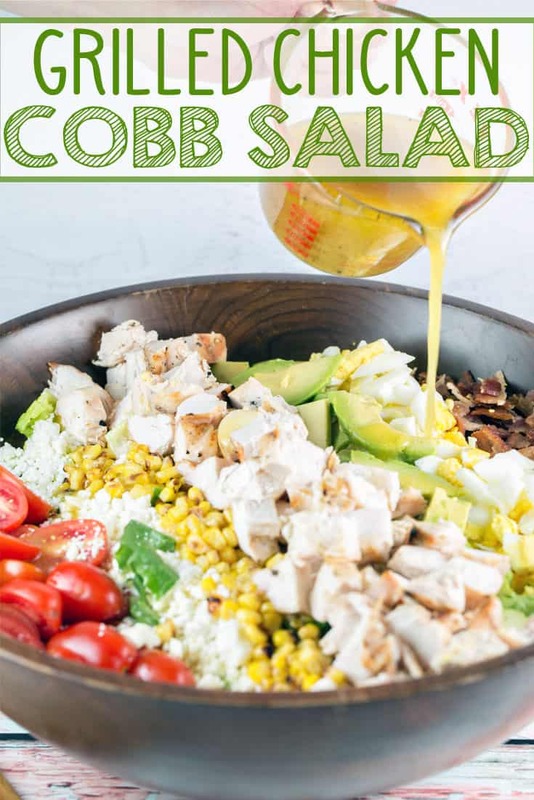 Are you familiar with the EAT COBB mnemonic to remember the ingredients for a Cobb salad? Egg, Avocado, Tomato, Chicken, Onion, Bacon, Blue cheese. If you notice my ingredient list, mine deviates a little. No blue cheese – I don’t like Roqufort. No onions (I’m not sure I’ve ever even seen a cobb salad with onion?). 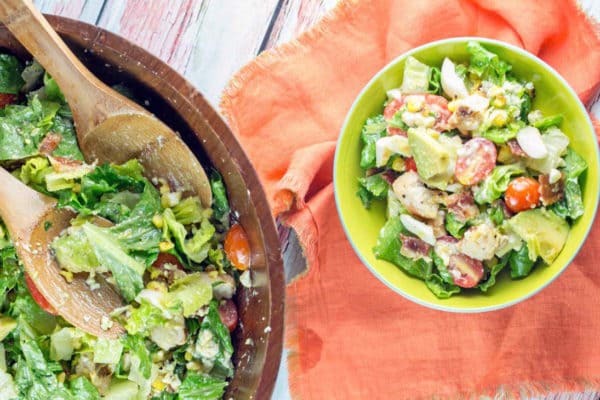 Cobb salads usually use a mix of greens, including iceberg… nope. But that’s what makes salads like this so great — add and subtract to your own personal preference. The temperatures may be cooling off, but you’ll still find me standing outside at the grill, manning the chicken. Because I refuse to give up my grilled chicken cobb salad as summer ends… even if mine are more like EAT CCBF (corn, feta) than EAT COBB. 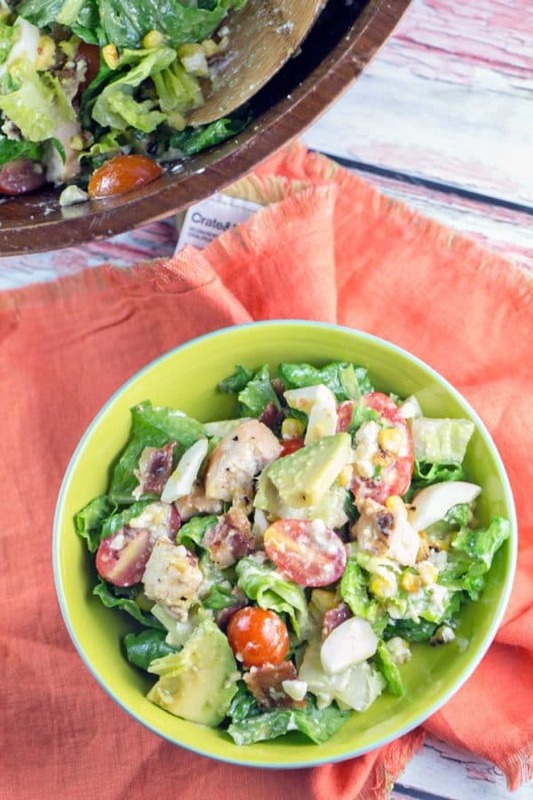 This easy grilled chicken salad is the perfect 20 minute meal to please the whole family! Preheat the grill to medium-high heat. While grill is preheating, cook the bacon over high heat, turning occasionally, until crispy. While the bacon cooks, place the eggs in a small saucepan. Fill with just enough water to cover the eggs. Place the saucepan over medium high heat, waiting until the water starts to simmer. Once the water is simmering, cover the pot, turn off the lid, and set a timer for 15 minutes. When eggs are done boiling, remove and place the eggs in an ice bath to stop the cooking process. Peel and chop. While the eggs are boiling, season chicken with salt and pepper, then place on grill. Grill over direct heat for 3 minutes, then flip and grill an additional 3 minutes. Move chicken to indirect heat (or reduce gas grill to low), then cook until the chicken reaches 165 °C, an additional 10 to 15 minutes. While the chicken cooks, chop the lettuce, halve the cherry tomatoes, and slice the avocado. 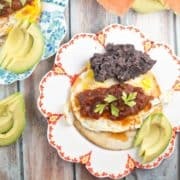 Place the lettuce in a bowl and arrange the bacon, eggs, tomatoes, avocados, corn, and feta on top. 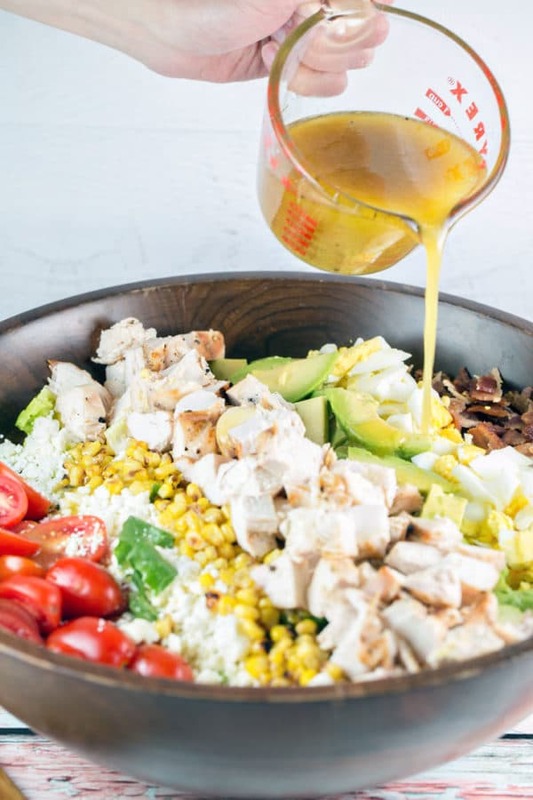 To make the vinaigrette, combine the canola oil, olive oil, red wine vinegar, lemon juice, spicy mustard, garlic, and salt and pepper in a small bowl and whisk to combine. When the chicken reaches 165 °C, remove from heat. Allow the chicken to rest for 5 minutes before slicing. Add chicken to salad and pour vinaigrette dressing over top.